If you ever have specific eBay questions, several eBay discussion forums on the Community page can help you. You can also go directly to the Discussion Boards to pose your question to the eBay members currently in residence. To get an answer on a discussion board, you need to start a thread by asking a question. Title your thread with your question, and you’ll no doubt get an answer to your query posted swiftly. You can get most eBay-related questions answered by going to eBay’s Answer Center, which you get to by clicking the Answer Center link in the Connect area. You then see questions covering almost any topic you can think of regarding listings on eBay. Just post your question and some kindly eBay member will probably suggest an answer. 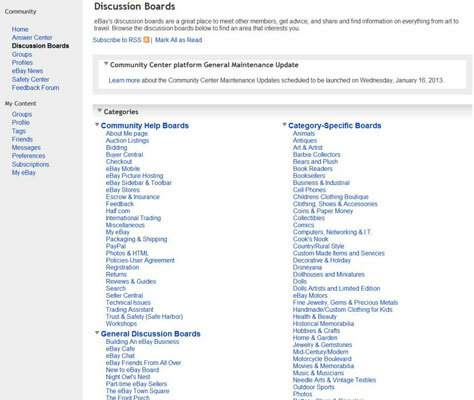 Auction Listings Help Board: This discussion board is a catch-all for many subjects. If you don’t see a board specific to your question (or if you post to another board and get no reply), try this one — it’s always hopping with lots of peeps (people). Photos & HTML Help Board: Good help from other eBay members for those with specific questions about using HTML and posting pictures in your auctions. Technical Issues: If something isn’t working right and you want an answer now (because you’re in the middle of putting up a listing), check the Technical Issues Help Board to see whether other members are experiencing the same issue. Many answers to tech issues can be found here.